APA offers both live webinars and recorded webinars for on-demand viewing. 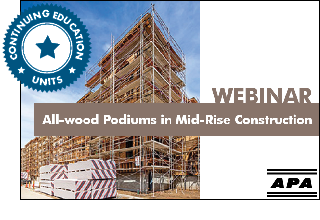 Topics include engineered wood basics, fire protection of I-joist floors, wall bracing, disaster-resilient design, design of all-wood podiums, and others. Some, but not all, webinars offer CEU credit; if credit is available, it is noted in the webinar description. Note: do not navigate to YouTube if you require a certificate of completion. Downloadable certificates are available only when viewed on the APA webpage in entirety, after completing a brief questionnaire. The demand for commercial and multifamily construction is soaring, and the framing industry is expanding to meet this demand. APA – The Engineered Wood Association has walked hundreds of job sites and identified the most common wood construction framing errors found in today’s nonresidential buildings. This session examines the consequences of these framing mistakes from the ground up, providing practical solutions for avoiding typical issues using APA’s resources as a guide. This course is approved by AIA (1 HSW/LU) and ICC (0.10 CEU). As energy codes become stricter, builders and designers are seeking options for energy-efficient construction that maintain strength, durability, sustainability and cost-effectiveness. 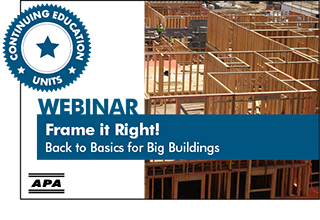 One effective solution is advanced framing, a system of construction framing techniques that optimize material use and increase energy efficiency. 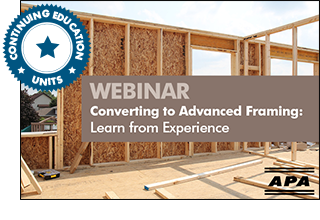 Join APA's Warren Hamrick as he discusses common advanced framing techniques, the benefits of the system and typical challenges that builders encounter during the conversion from traditional framing to advanced framing. This course is approved by AIA (1 HSW/LU) and ICC (0.10 CEU). The 2012, 2015 and 2018 editions of the International Residential Code (IRC) include fire-protective membrane requirements to enhance the fire performance of floor systems. Presented by Robert Neale of Integra Code Consultants, former vice president of National Fire Service Activities, this training focuses on assemblies that meet the fire-protective membrane requirements of the code, specifically as they relate to I-joist floor systems. This information is presented in the context of what firefighters, fire officials and code officials should know about code requirements and tested alternatives to ensure requisite structural performance in fire conditions. This course is approved by AIA (1 HSW/LU) and ICC (0.10 CEU). Using the performance path to meet energy codes offers many benefits to builders, designers and code officials. APA Engineered Wood Specialist Matt Brown presents Meeting the Energy Code Using the Performance Path; a one-hour presentation that focuses on the advantages to performance-based energy code compliance, pathways to comply with energy codes and the impacts of different materials and systems on energy efficiency. The presentation identifies cost-effective ways to meet the energy code. This course is approved by AIA (1 HSW/LU), ICC (0.10 CEU) and RESNET (1 PDH). Proper connection design and specification is important to the structural performance and serviceability of any wood-frame structure. 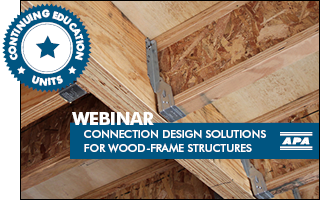 APA Engineered Wood Specialist Robert Kuserk, PE, presents Connection Design Solutions for Wood-Frame Structures, a one-hour presentation featuring wood connection design, including common fastener types and their design values. The presentation also includes the orthotropic nature of wood and its role in connection design, commodity and specialty connectors, the use of steel connectors in wood-frame construction, and techniques for designing efficient, durable and code-compliant connections. This course is approved by AIA (1 HSW/LU) and ICC (0.10 CEU). Force Transfer Around Openings (FTAO) is a popular method of shear wall analysis for wood-framed buildings. APA Engineered Wood Specialist Alese Ashuckian, PE, presents Shear Wall Analysis Made Easy: Force Transfer Around Openings Calculator. 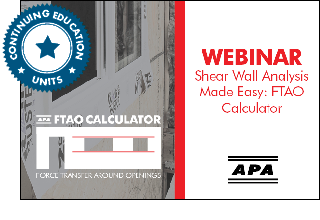 The presentation includes an overview of APA’s free design tool, the FTAO Calculator, and explains how it can help engineers and code officials in the design and implementation of FTAO shear walls, with a focus on asymmetric piers and multiple openings. This course is approved for ICC and AIA continuing education credits. 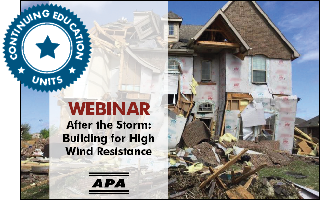 APA Engineered Wood Specialist Mary Uher presents After the Storm, a webinar focusing on common structural failures observed during storm damage assessments. The presentation includes an overview of high wind forces, the importance of a continuous load path, and how good design and construction practices can improve the storm resistance of buildings. Mary also discusses code requirements and APA’s above-code recommendations for wind-resistant building, as well as how attention to connection details, understanding lateral load concepts, and recognizing common failure modes seen in storm damage assessments can help builders cost effectively build a safer home and reduce future storm damage. This course is approved by AIA (1 HSW/LU) and ICC (0.10 CEU). 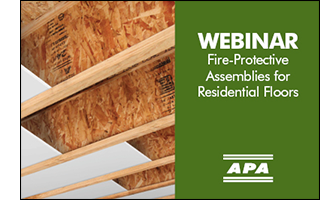 This APA webinar focuses on several different floor assemblies that meet the fire protective membrane requirements of the International Residential Code, specifically as they relate to I-joist floor systems. The webinar reviews the options in the IRC, including drop-in gypsum board (supported on top of bottom flanges), partial sprinkler systems, and fire protective coatings. This webinar does not offer continuing education credits at this time. Manufacturers, distributors, and builders are all reporting a critical need for training as they rebuild from the recession and hire new employees. 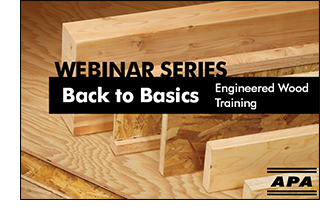 APA’s new, comprehensive training series includes six “back to basics” modules that cover key topics related to I-joists, Rim Board®, laminated veneer lumber, and glulam. The training modules run between 30 and 90 minutes each and are presented by an APA Engineered Wood Specialist. Modules that last an hour or more offer continuing education credits for participants. All-Wood Podiums in Mid-Rise Construction is an architectural case study on the use of an all-wood podium in mixed-use design. Mid-rise podium construction, up to four stories of wood framing on top of a concrete first story, has been widely used throughout North America for many years in order to build an economically superior superstructure atop a more traditional commercial construction type below. With the introduction of substituting a wood podium for concrete into this construction type, the overall construction cost has further decreased as well as the construction time, while creating a more sustainable, less massive, and more uniform building. This presentation provides a solution to building a green and cost effective structure using a wood podium as well as addresses design challenges such as durability, fire protection, sound transmission and designing for high seismic loads. Several recently construction buildings in California will be analyzed with lessons learned shared by the project teams. Approved for credit by AIA. 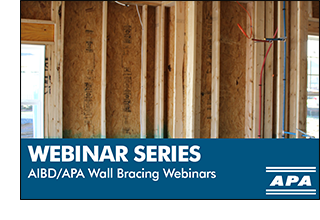 The Wall Bracing Webinar series is presented by APA and AIBD (American Institute of Building Design), a non-profit association dedicated to the enhancement, development, and recognition of the residential and building design professions. The five-part series begins with a one-hour introductory session covering wall bracing history, theory and strategy. Additional sessions address related topics, including meeting code requirements with wall bracing, the simplified wall bracing method, and bracing for higher seismic and wind zones. 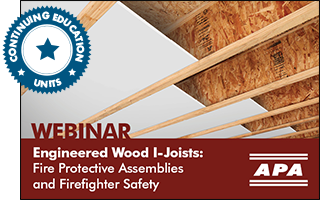 Series presenters include Bob Clark, Roger Roatch and Bryan Readling, APA Engineered Wood Specialists with a combined 63 years’ experience providing engineered wood product building and design support and recommendations. APA has collaborated with code bodies since the 1950’s to improve wall performance and reduce the risk of catastrophic home failure through the development of prescriptive wall bracing techniques that specify plywood and OSB wood structural panel sheathing. Note that, at this time, CEUs are not available for the Wall Bracing I–V series of prerecorded webinars.